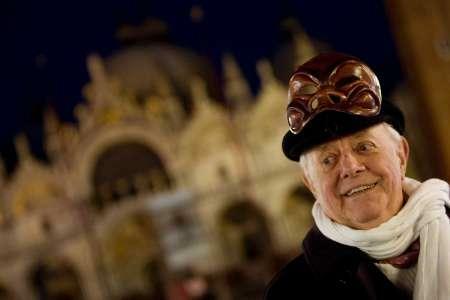 Dario Fo is one of the most pre-eminent comic writers and performers of our times. He’s written a number of plays that have been performed throughout the world and seem to have a universal appeal. When he performs in Italy, he performs in soccer stadiums– partially because that’s where enough people can come and see him, and partially because he feels strongly about reaching out to the working class people– and they rarely go to the theatre, even in Italy. In 1997, his work earned him the Nobel Prize for literature, which inspired a lot of jokes about how any clown can win a Nobel. But if you know Dario’s work, he’s not just any clown. 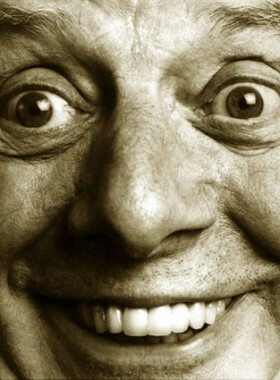 As I mentioned earlier, In 1996 I had the good fortune to follow Dario Fo around Copenhagen for 3 weeks. (And in 1997 he won the Nobel prize.) I’m not saying there’s a connection between these two factoids– I leave that for others. I had come to Copenhagen because Dario Fo, Jerzy Grotowski, and Eugenio Barba were all going to be in the same place at the same time– as part of ISTA and Culture ’96. I had a week of ISTA and then another 10 days of traipsing around Europe (I thought) When I got there, I realized I had to stay in Copenhagen, as there was a Commedia Festival going on, and Dario was slated to teach there. I snuck my way into master classes with Dario and Ferrucio Soleri, saw as many shows as I could afford, and went to every appearance of Dario’s that I was able to, including a magnificent art exhibit of his work preparing for his plays. Dario and his wife Franco Rame gave lectures at ISTA about their work, translated by Ron Jenkins, who is their American translator and on-stage interpreter. They had warned us that Dario was recovering from a stroke, so he was very weak, and may not speak long, and that this was a speech and not a performance. And when he began, he was a little soft spoken and quiet, and spoke like somebody who was recovering from a major illness. But as he began to speak he seemed to get stronger, not weaker, and by the end of the lecture/demo he had lost about 25 years, and seemed as strong as a bull. His joy of performing and feeding on the energy of the audience was palpable. Dario spoke Italian so clearly that I almost felt that his translator wasn’t needed. He performed several pieces, most memorable the beginning of the Lazarus piece from Mistero Buffo, where he transforms himself into 20 characters (with 20 different Italian dialects and ways of speaking) as he looks for the place where the miracle man is going to do his thing. (my favorite part is when he explains to the ladies in the front not to get so close to the front, because the crowd is unruly, and they might get pushed into the grave and bump their head and go into anaphylactic shock and die– and “Ladies, please remember, our miracle man only does ONE miracle a day.” ) I’ve attached a video of this piece below- it’s wonderful to see, even if you don’t speak Italian. He’s hilarious. Here a video is worth a thousand words– would that every actor was as clear in his characterizations, and as spirited and full of energy. And check out the related videos for all sorts of other great videos of Dario.